"This cool, refreshing salad can also be used as a relish. It is always a hit!!" In a small saucepan, combine sugar, vinegar, and olive oil. Season to taste with salt, black pepper, and celery seeds. Heat until hot, but not boiling. Cool. 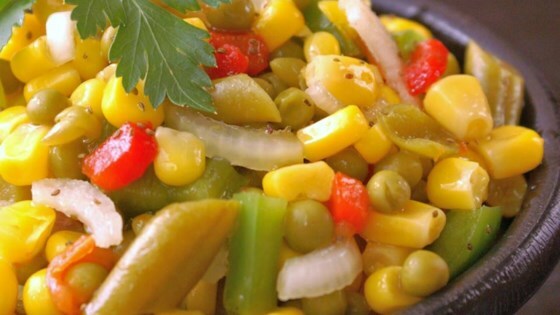 In a large bowl, combine corn, peas, green beans, onion, green pepper, and pimentos. Pour cooled vinegar mixture over vegetables; mix well. Chill in the refrigerator overnight. Serve cold. This salad was excellent and loved by all at our church picnic. I would definitely try this recipe again. It was a hit and very economical. Thanks. We LOVE this salad. The veggie mixture is awesome. Who would have thought? I follow the recipe exactly. It does not need any tweaking. Thanks!